SAN DIEGO – The Mountain Empire running game was full go as it dominated Hoover’s defense behind Nathan Rose and Estaban Castillo, who both rushed for over 100 yards and the team rushed for 303 total yards, in a 41-0 win over host Hoover – the RedHawks’ second-consecutive shutout. 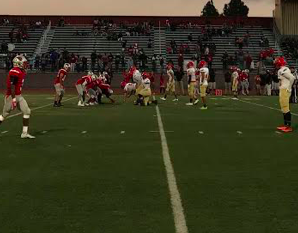 The RedHawks received the opening kick and proceeded to drive straight down the field for a touchdown as they ran the ball every play on the drive. Gabriel Hydorn only threw the ball eight times but two were for touchdowns, as Ryan Sawyer scored on a 14-yard pass and sophomore Marcus Smith scored on a 37-yard strike. Hoover’s first drive was halted by an interception by Dallas Prince that he returned 34 yards. 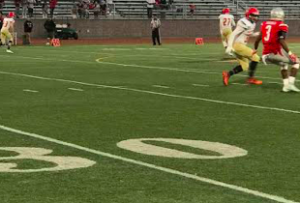 The RedHawks’ offense went back to work again and scored. At that point, the route was on. The defense held the Hoover offense to 75 total yards as it was once again led by MLB Cameron Will, who had 14 tackles, including five tackles-for-loss. TFL. Prince had seven tackles, while Charlie Sallee had six tackles, two Sacks, and a fumble recovery. Tony Arce had five tackles, one sack, and a fumble recovery, while Rose finished with 118 and two touchdowns and Castillo had 117 yards and two TDs. Hydorn passed for 61 yards. “I feel like yesterday’s game was a big win for my team,” said MEHS senior MARQUIS DAVIS. “I’m proud that even with all the trash talk, my team was able to have their minds focused on winning. I think if we just keep working hard at practice and stay together we can win another one next week. Next week the RedHawks travel to Yermo to take on Silver Valley. Silver Valley defeated Mountain Empire convincingly last season. “In order to win next week, I think the team needs to read the ball a little better and keep our minds right,” Sawyer said.